Forklift approach warning lights are an economical way to help alert people on foot to the approach of a forklift, AGV, or other industrial vehicle. In this case, we are able to show you how visible these lights can be in a setting where an order picking vehicle is traveling through a rack aisle, and where someone’s perspective might not allow them to see the approaching danger. The light is very visible, up to fifteen feet preceding the lift. Joel Pason has been named Cisco-Eagle’s Employee-Owner of the Year. The award recognizes an employee-owner that has gone beyond what is expected to promote and support the ownership culture at Cisco-Eagle during the fiscal year. Pason, a Project Manager in our Oklahoma City Systems & Design group, has been with Cisco-Eagle since 1999. Check out this video from ESH Safety News America for some common ways people fall in a variety of situations. The video is informative, and sometimes funny (see the shovel part), but the consequences of a slip & fall accident certainly are no laughing matter. There isn’t much value in a worker walking across a facility; value is realized at work areas, not in transit between them. 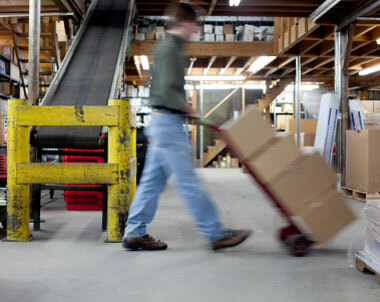 In many operations, order pickers can walk as many as 12 miles a day. This level of walking makes workers tired and more prone to error, injuries, and declines in productivity. While some degree of walking is unavoidable, much of this is simply commuting time to retrieve supplies, or inefficient design that makes the job harder and less efficient than it should be. How can you reduce time walking, and increase the time people spend getting things done? There is some confusion about the different finishes that can be applied to a pallet rack wire deck. Various manufacturers offer different finishes, and you may have need of more than one of them for different types of storage applications. This primer on the common finish options can help you make decisions about your warehouse, load, rack and application.